UPMC Home Healthcare understands that illnesses and hospitalizations can be upsetting. By providing you with the care you need, when you need it, many visits to the emergency department or hospitalizations can be prevented. What is the ED U-Turn to Home Care Program and how will this benefit you? The ED U-Turn to Home Care Program has several important features that will provide you with excellent healthcare that begins in one of our UPMC Emergency Departments and continues with Home Health Nursing care in the comfort of your own home. The highly skilled Emergency Department medical team will assess your condition and work with you to decide if your condition can be safely treated in the comfort of your home. You will receive an in-home visit from a highly qualified home health nurse within 24 hours of your Emergency Department discharge to continue the care to improve your health. Your nurse can help you to schedule follow-up appointments, and talk with you about symptoms that may need additional medical treatments or services. Additional services include Physical, Occupational and Speech Therapy, Home Health Aide Services, Registered Dietician and Social Services. The home health nurse will work with your PCP to create a plan for your care and follow-up medical needs. The nurse will also update the Emergency Department staff on your progress after your initial visit. As an ED U-Turn patient, you will also have phone access to a Home Health Nurse after business hours in the event that you have symptoms that concern you. 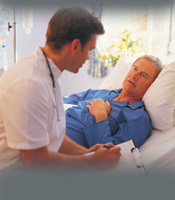 Call 1-800-493-3760 to see if your hospital participates in the ED U-Turn to Home Care program.